Two Boxing Days ago, Danielle and I ventured to the most packed mall in the city – Yorkdale Shopping Centre. It is by far the busiest shopping location on any given day of the year, so the thought of spending the first day of an extreme sale season there is a little insane. I guess we were feeling adventurous or something. On that trip I saw this beautiful (and affordable) Burberry rip-off in the window of Danier leathers, but because it’s such an oversized style, I couldn’t get away with a size small. I needed a XXS. Of course, it wasn’t available at any store I could possibly reach. A few weeks later, I was able to order it in from out of town. I could finally wrap my loving arms around this glorious creation!!! To this day it’s my warmest winter coat (only because all my other coats are fashionably cropped or insulation-less), so I’ll continue to rock it like shearling is still cool/relevant. Today I wore it with similarly-coloured pants. It’s like ~all black everything~ except with a poo-like colour. I am so innovative. 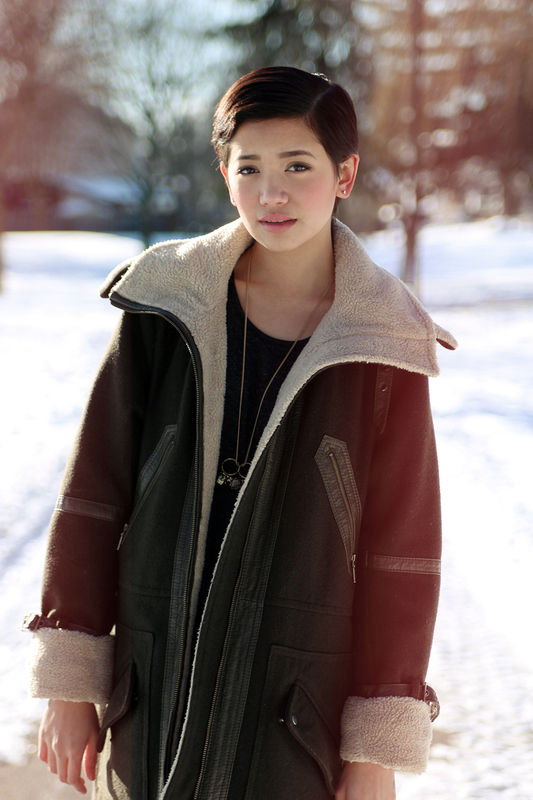 By Bianca Venerayan on January 4, 2013 at 3:37 am | Posted in outfits and tagged canada, danier, fashion, gap, obey, piperlime, style, tinley road, toronto, urban outfitters. The jacket looks great on you! And the boots…L.O.V.E.